Super Bowl Party over here! We were excited for Super Bowl! My team was playing(Patriots). Ms. Hyperdiva loves Katy Perry, Super Samurai loves football in general, and Wise One just loved the food. I planned this out for almost two weeks, and would have made it even if my team wasn’t playing. The underlining reason: tons of leftovers. We have girl scouts the next day, and we do leftovers or I crockpot something, so I used Superbowl as an excuse to cook this much. What did we have? Glad you asked, lets get into it! My first thought was the famous southwestern egg rolls from chili’s. You peeps know me, if I can make it, I’m not buying it. Guess what? Not only did I make it from scratch, but they were awesome, and easy to make! I would say to make them the night before, but the process is really easy. 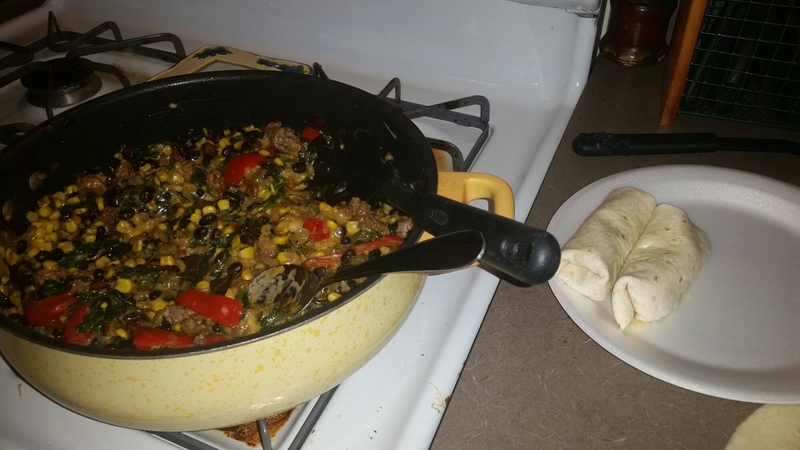 Red peppers, onions, celery, spinach, cheese, black beans, seasonings, flour tortillas, and……leftover Italian sausage/chicken. Yes, I had leftover meat from pizza night so I used it in these and the pizza egg rolls. Assembly line the ingredients and built. Time consuming, but hey, I turned on zombie bowl, and was all good in my kitchen. The pizza rolls were easier. 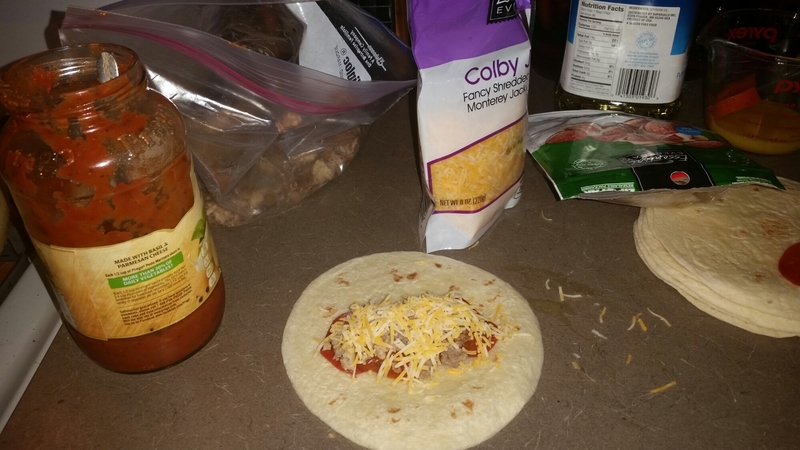 Flour tortillas, turkey pepperoni, pesto marinara sauce, cheese, and the leftover meat. Assembly line again, and got them done. 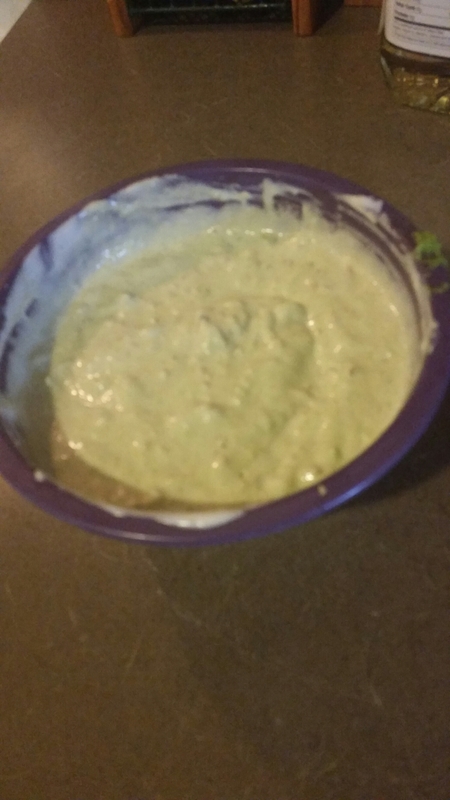 Made the Avocado Ranch sauce. 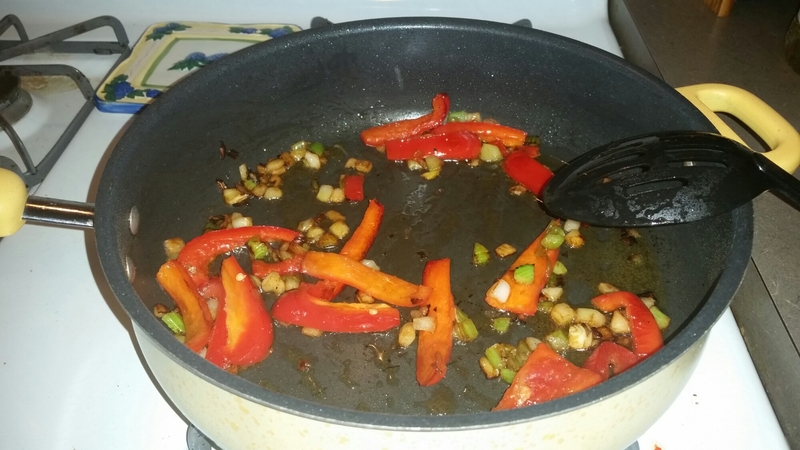 Now, I cheated on this recipe. I found the recipe for making this from scratch, but I said forget that. I got more to do. I got two avocados, and a bottle of ranch dressing. I’m even sitting here thinking about how I could have made it with bacon bits, for the meat lovers, but stuck with the traditional eaters. Just mashed up two really ripe avocados, and mixed the ranch into the avocados. Boom, done. I continued by throwing the fries into the oven, and moving onto the cake. I made a patriots championship cake. I had to. Come on, we knew who was winning? Anyhow, I kinda cheated on this one too, but not by much. I read about making a pineapple upside down cake, and adding vanilla pudding. Well I changed it a bit. I bought a banana supreme cake mix. More because I had no cake flour, and was on a time constraint for getting done. 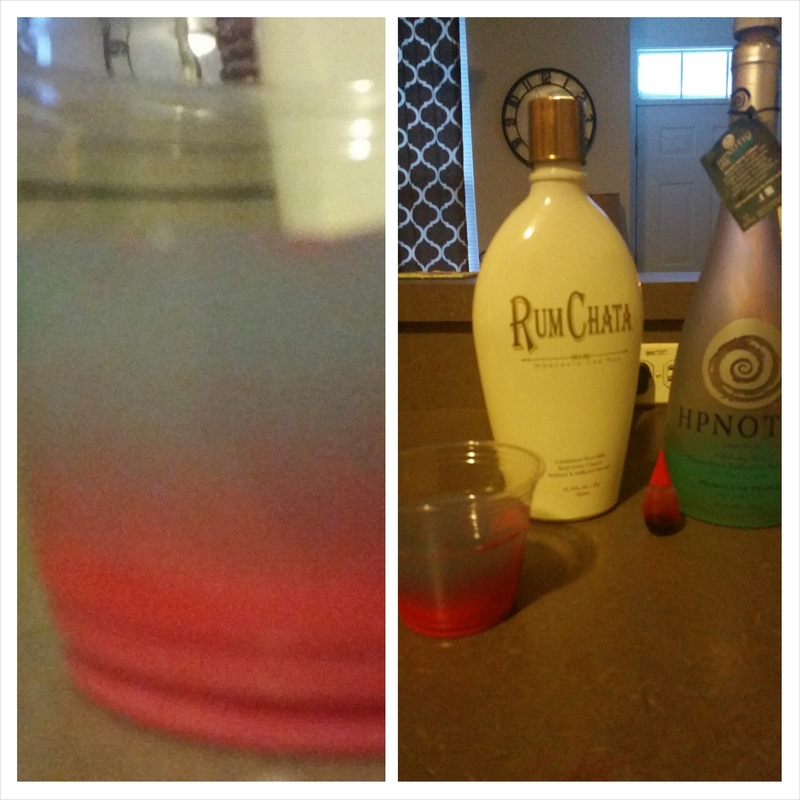 I added….. Yes! 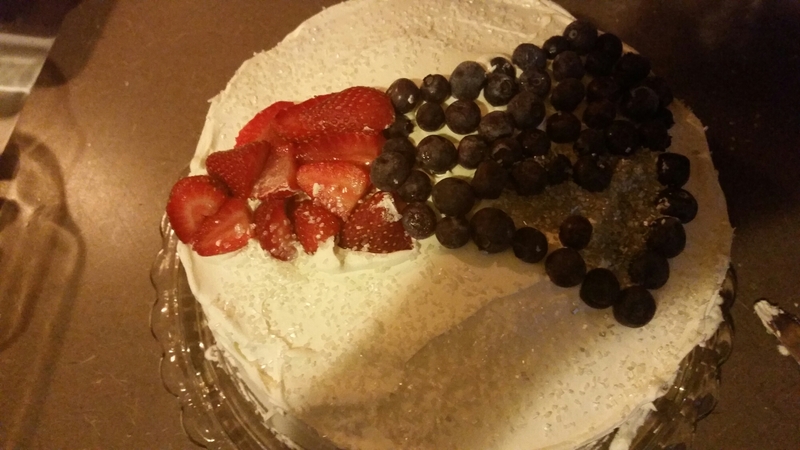 I made the cake according to the directions, but just added the pudding mix. Tastes just like banana creme pie. Baked that, and let cool. About thirty minutes later, I add my icing, which is cool whip. No regular icing, just cool whip. I love using cool whip as icing vs frosting. Just easier to handle and way less calories, if your counting(25 calories per 2 tbsp in cool whip vs. 140 calories per 2 tbsp in most frostings). I tried to recreate the patriots symbol on the top of the cake. Flippin humanities class. It was an abstract look, but I think it was awesome over all. Strawberries, blueberries, and sprinkles. Kids loved it! 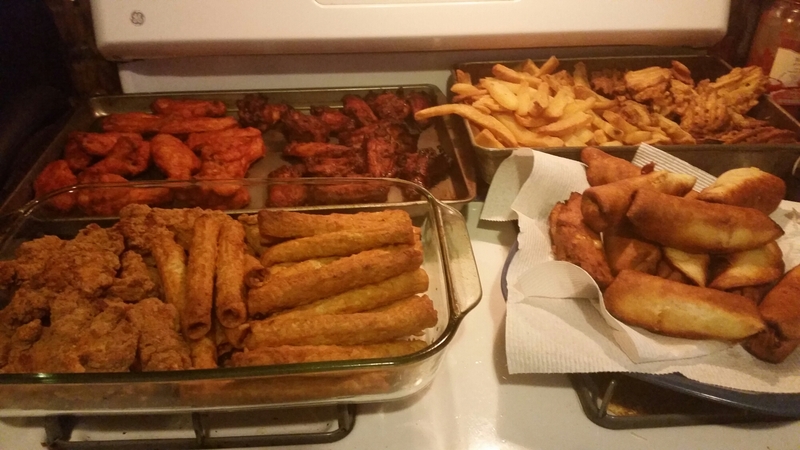 Made the hot wings, bbq wings, taquitos, and chicken fingers. Seasonings, sauces, and I bought the taquitos, because I haven’t figures those out(yet). I purchased the kids favorite potato salad(other then my own), and macaroni salad. 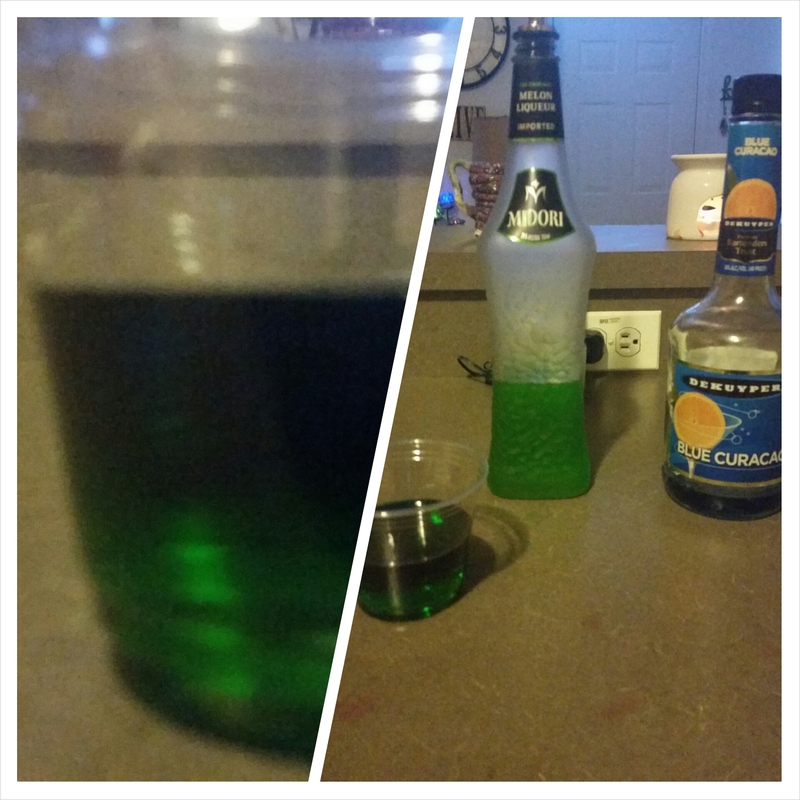 We used the remaining egg roll filling for nachos, and I wrapped up the dinner with the two shot drinks I created. I call them the New England Patriot Touchdown vs the Seattle Seahawk touchdown. Premise is to drink every time there was a touchdown. I didn’t drink, but would have if it was a big party. In the midst of the blizzard and being snowed in, we had a blast, and I cursed out my tv so many times. 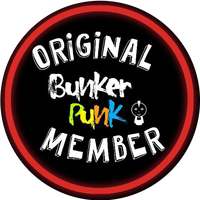 I want to also say shout out to my facebook family(related or not) for the great time we had talking all kinds of craziness on my personal page! On to my next big project. Hope everyone had a great time last night! Next Post Open letter to my community!